I offer more than just a homemade Baileys Irish Cream recipe from scratch, check out more drink recipes at the end of the page. This easy Irish cream recipe is so much better than the store bought version; so creamy and delicious. Makes great gifts too. In a blender, combine all ingredients and blend on high for 20 seconds. Store in a tightly sealed container in the refrigerator. Will keep for two months. Enjoy every drop. Baileys on the rocks is wonderful. You can also add some to coffee on a chilly winter day. 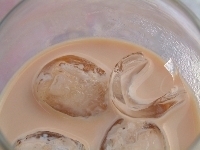 In a glass full of ice, add 1 ounce of vodka and 1 ounce of coffee liqueur, fill with homemade Irish cream. Add to hot chocolate with a pinch of cinnamon and top with whipping cream. What a great way to save money and treat yourself. This recipe takes 30 days and is from topsecretrecipes.com. Mix the water, coffee and sugar together in a covered saucepan over high heat. Bring mixture to a boil and continue to boil for 10 minutes. Make sure it doesn't boil over. Remove mixture from the heat and let cool for five minutes. Add vodka and vanilla. Stir and pour into the empty 750 ml bottle you want to keep it in. Be certain that you use a covered saucepan when making this drink. The alcohol will coil away if the solution is not covered when it gets hot. Close bottles tightly and keep in a cool dark place for at least 30 days.